“We are one with the earth” – what a tired phrase. But leave it to an enterprising artist to effectively undo that cliché. 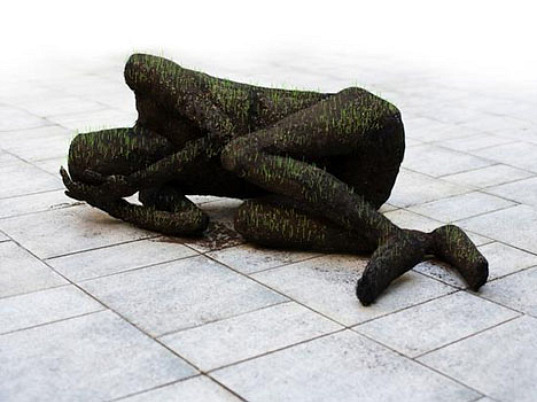 Mathilde Roussel Giraudy has created a series of soil sculptures, entitled “ca pousse!” (“it’s growing!”) – an array of human forms set in various states of peril. Each piece has been planted with wheatgrass to create a human-likeness meant to slowly sprout and decay. Read more about this sculptural (semi) circle of life after the break. Inspired by her rural roots in France and an upbringing that placed preservation, traditions and connection with the land paramount, originally, Giraudy set out to create a series of sculptures in wheatgrass to illustrate that “food, its origin, [and] its transport, has an impact on us beyond its taste.” But looked at more closely a different message comes across entirely- one that reminds us of our connection to the Earth’s cycles and its elements. "We are one with the earth" - what a tired phrase. But leave it to an enterprising artist to effectively undo that cliché. Mathilde Roussel Giraudy has created a series of soil sculptures, entitled "ca pousse!" ("it's growing!") - an array of human forms set in various states of peril. 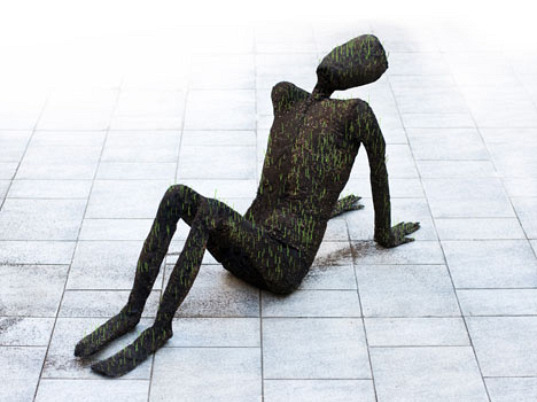 Each piece has been planted with wheatgrass to create a human-likeness meant to slowly sprout and decay. Read more about this sculptural (semi) circle of life after the break.